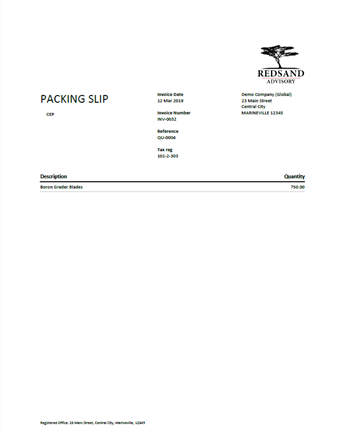 The packing slip and invoice template is 2 pages, and contains an invoice and a packing slip. Xero will generate both together, each time you print an invoice that uses this branding theme. Delete the content on the 1st page if you don't want an invoice when you print the packing slip. Click the organisation name, select Settings, then click Invoice Settings. Click New Branding Theme, then select Custom .docx. Give your theme a name, eg Packing slip with invoice. Next to your theme, use the Upload button to upload the template. For a new packing slip, click the add icon , then select Invoice. Enter details of your sales invoice. Select the branding theme you set up for printing the packing slip. Save and approve your invoice. Print your packing slip to PDF. 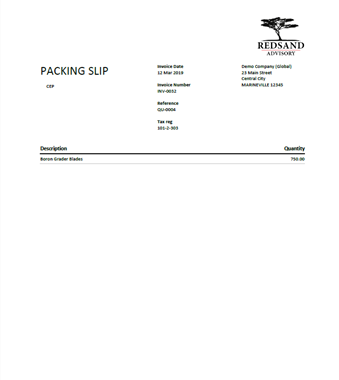 To create a packing slip for an existing invoice, you can edit the invoice and select your packing slip branding theme. If you removed the invoice content from our packing slip template, you'll need to select a different branding theme when you want to generate the invoice. Red Sand Advisory (Pty) Ltd © 2014-2019.